So many people want thicker, longer hair, but the formulas in stores can cost a fortune. Thankfully, you don’t need that stuff because there are so many hair growth products already sitting in your kitchen! All you need is to know what to combine and how much to use, and we’re here to help. Mix one tablespoon of mustard powder with a little bit of warm water. Two or three tablespoons of water will be sufficient to make a paste. Then add three tablespoons of olive oil and one egg. Blend all these ingredients together, until you get a smooth paste. 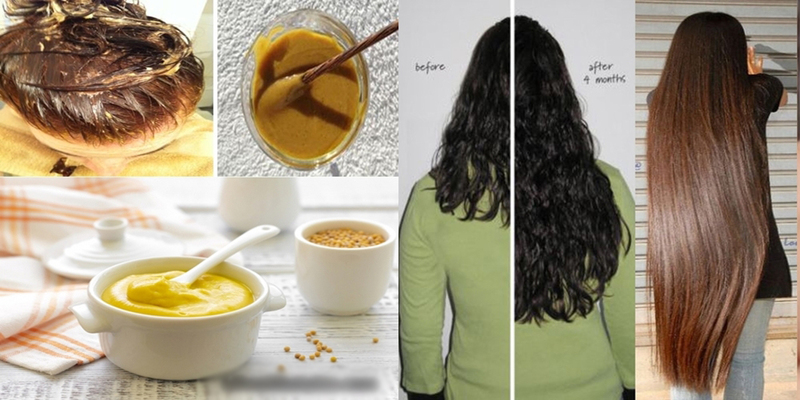 Apply this mustard mask on dry, unwashed hair (roots only). Concentrate only on the scalp. Optional: For extra shine you may add some olive oil (or coconut oil, linen oil, sweet almond oil) to the length of your hair. After you’ve applied the mask, put on a shower cap and then a warm towel. The mustard gives a strong heating effect. It boosts blood circulation on your scalp, and hence triggering hair growth, thickness and shine. Leave the mask on your head for around 3-5 minutes, depending on how well you can deal with the heat. If it is too much for you to handle – wash it off instantly! Do this treatment only once a week over a period of 5-7 weeks.